How do you obtain a competitive advantage amongst other waxing salons? 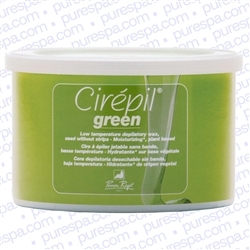 With Cirepil's Green - a superior wax on Today’s market by a leading wax manufacturer. As a representative for Pure Spa Direct, I am constantly looking to find the best of the best wax products to recommend. I have always favored Cirepil products because they ensure maximum results. After hearing about Green, I had to try it. I am a huge fan of every wax by Cirepil, but Green is by far the best wax I have ever tried. Green is a vegetable-based hard wax that is enriched with sunflower oil, shea butter, and candelilla- all moisturizing ingredients that will leave your skin baby smooth. As a hard wax, the thin texture makes it extremely easy to apply for the technician. The special formula is designed to adhere to the hair, with less traction on the skin, making the process as painless as possible for the client. As an Italian, having thick coarse hair, and very sensitive skin, waxing has always been ridiculously painful. It is the dreaded torture that you just can’t wait to be over. Of all the wax products, Green provided me with the most pleasurable wax experience (if that’s even possible)! The enriching based formula left my skin feeling silky, smooth, and moisturized. I was truly amazed at the results and how little it hurt compared to other wax products! It is a highly competitive market, and it is important to distinguish your salon from your competitors. Offering clients a premier wax at your salon like Green, will enhance their spa experience and ensure impeccable results. Clients will become repeat customers, and they will bring their friends. Next time you’re considering introducing a wax product into your spa or salon that will ensure customer satisfaction and distinguish you from the clutter….Think Green!